*30 Day Free Trial Available* - HylaFAX is the world's most popular, widely deployed enterprise-class fax server. As the de-facto standard fax solution for Unix-like operating systems, HylaFAX is included in many standard Linux distributions. HylaFAX is designed to be very robust, reliable and scalable, and its client/server API and open architecture offer many ways to integrate HylaFAX into your document management workflow. 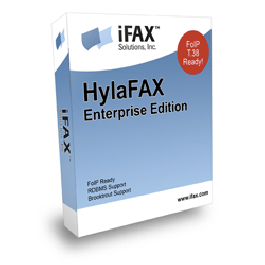 HylaFAX Enterprise, a product of iFAX Solutions, adds several key features such as T.38 Fax Over IP support, native database integration and barcode decoding. Our software-based T.38 'modems' eliminate the need for expensive PCI fax cards, and allow HylaFAX Enterprise to be completely virtualized. Today, iFAX Solutions expands on this platform by offering the ease and flexibility of AWS support! Our appliance is a stand-alone, pre-configured and self-installing HylaFAX Enterprise server AMI that has been optimized for Amazon AWS. Connect your HylaFAX Enterprise server to any T.38 Fax Over IP service provider (we recommend http://www.t38fax.com) and be up and running within minutes.